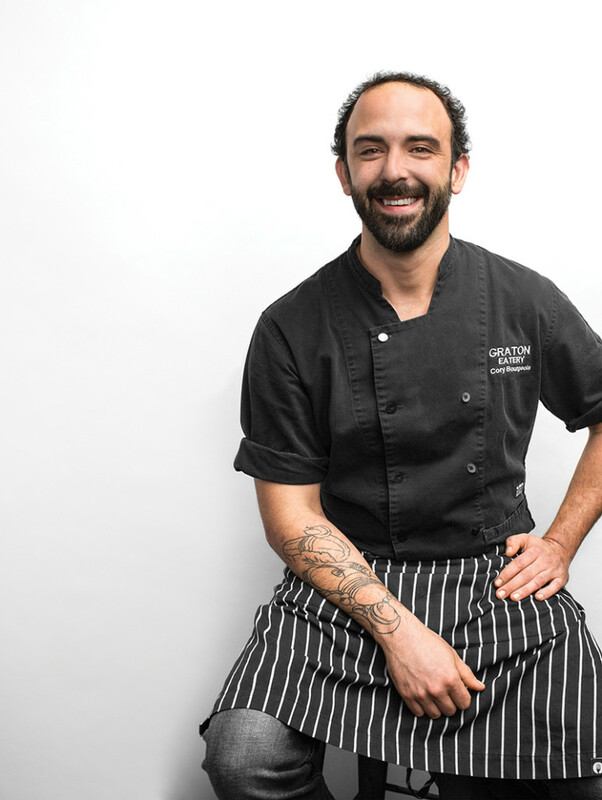 Chef Cory Bourgeois, along with partner and self-described “boss lady” Hannah Ellaham, opened Graton Eatery in St. Martinville last June, an homage to the home-cooked breakfasts, lunches and belly-filling snacks that fuel south Louisiana. Graton Eatery’s selection of house-made meats, charcuterie, sandwiches, beignets and plate lunches makes it the kind of place that will fill you up and bring you back for more. While originally open only for breakfast and lunch, diners have begged for more. Chef Bourgeois also gave us a bonus scoop. Salmon: Preheat oven to 400 F on convection. Rinse 12-14 ounce salmon (skin on) with cold water and pat dry with paper towels. Drizzle olive oil, salt and pepper on both sides and place skin side down on the sheet pan. Bake for 7-9 minutes, depending on your preference of final cook temperature. Immediately transfer to a serving dish. Place two medium sized sauté pans on high heat. Add 1 tablespoon of olive oil to both while hot. Place carrots and potatoes in one pan and the broccolini in the other. Season the broccolini with 1 teaspoon chili flakes and salt. Cook the broccolini on high for 2-3 minutes. After 3 minutes, squeeze half of a lemon over broccolini and remove from heat. Season the potatoes and carrots with salt and pepper then cook on medium high heat for 7-8 minutes. When the carrots are tender add 1 tablespoon of butter to the pan, give them a toss and remove from heat. To serve: Place a healthy spoonful of your yogurt sauce on the bottom of each plate followed by your carrots and potatoes, broccolini, and salmon. Top each piece of salmon with a spoonful of gremolata. Enjoy! In a small mixing bowl, combine 3 cloves of garlic (minced), ½ cup parsley (chopped), 2 tablespoons of chopped pecans, juice of 1 lemon, salt and pepper. Combine ½ cup Greek yogurt, 3 cloves of garlic (minced), juice of ½ lemon, ½ teaspoon tumeric, salt, and fresh black pepper in a separate mixing bowl and allow to sit in the fridge for an hour. Note: The sauce is best when allowed to marinate for an hour, but can sit in the refrigerator for up to 24 hours. This will allow the flavors to develop.